The GN2 buffer tank, part of ITER’s Cryogenic system, has been delivered on-site, Cadarache, October 2017. The biggest fusion device will require a massive “refrigerator” to perform several tasks: first, it will have to cool down its magnets to -179 ° C so that they become superconductive, second, it will help the cryopumps to minimise any thermal losses in the cryostat, and third, it is going to improve the thermal insulation of ITER’s massive vessel in order to create a vacuum. ITER’s Helium (He) plant is estimated to handle approximately 24 T of He, which corresponds to the gas needed to fill up 14 million helium balloons. The plant will consist of 7 warm Gaseous Helium (GHe) tanks (7 x 360 m3); one Liquid Helium (LHe) storage tank with a capacity of 175 m3 at 4.5K (-268.5 °C), able to store up to 85% of the gas that the plant will need, and two quench tanks. 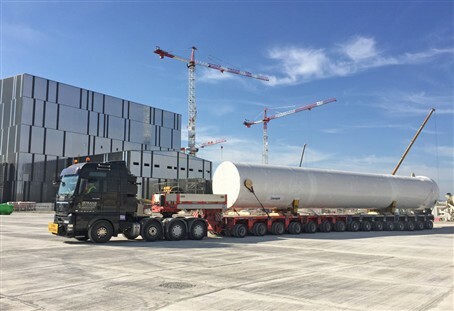 The LHe tank, widely considered as the “jewel” of the ITER Cryoplant, has finally reached the construction site. This double walled vessel measuring 25.5 x 3.8 m, manufactured by CryoAB (Sweden), has the capacity to handle 20 T of Helium. The whole manufacturing and testing activities required for the acceptance of this tank took one year and a half since the approval of its design. The transportation from Goteborg has been performed in two phases: one by boat up to Fos-Sur-Mer, the industrial port of Marseille, and the final trip to the ITER site by a special convoy. Meanwhile on the construction site, a few metres away from the Tokamak complex, the Cryoplant facility is shaping up. It boasts a brand new façade and the last layer of cladding is almost completed. The building is getting ready to house the equipment that has been delivered.